Due to the economic recession, the orchestra is shut down. The members hear later that the orchestra will be reformed. Only some of the members, who have not yet been rehired, gather for the orchestra. For the first time since they disbanded the orchestra plays together, but they sound horrible. At that time, the conductor Tetsusaburo Tendou (Toshiyuki Nishida) appears in front of them. The orchestra members are not familiar with Tetsusaburo Tendou's background or career. At first, the members of the orchestra are resistant to Tetsusaburo Tendou. They change though as they are brought into Tetsusaburo Tendou’s unprecedented world of music. 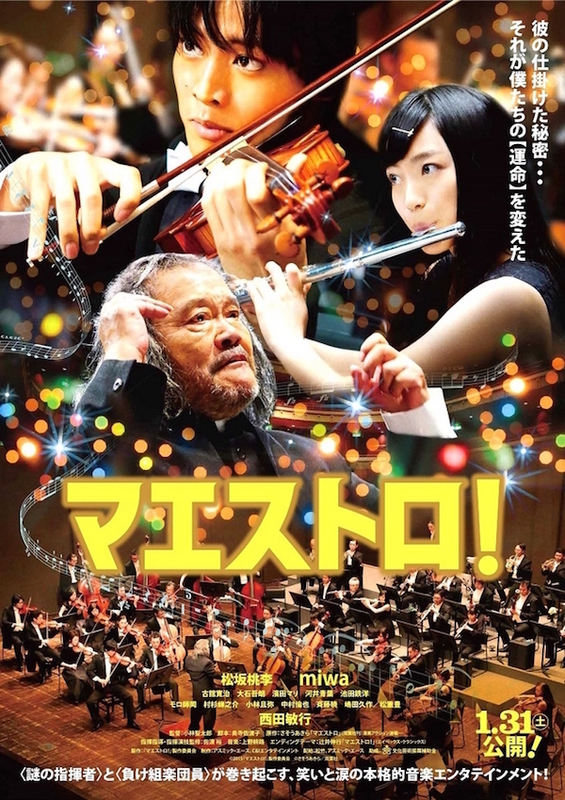 Except for the concertmaster Shinichi Kousaka (Tori Matsuzaka), the members of the orchestra, who all have their own wounds and frustrations, recover their confidence. Based on manga series "Maestro" by Akira Saso (first published 2003 in Weekly Manga Action). Hahnecho Jun 19 2015 9:45 am I second Dantilona's review. It has an element of a typical Japanese tear-jerker but a great film, nevertheless. I enjoyed it and I am not a movie nut. Dantilona May 26 2015 12:09 am This is a brilliant film, deeply moving and giving rich insights into Asian culture, both teaching and relationships. What kinds of risks do leaders take to turn around a second-rate orchestra (company, university)? Can they learn from their mistakes if they are pushing too hard, or misjudging how to work with an individual or a group? What determines the approach that will work best for an individual or a group with a specific cultural heritage? How acceptable are different approaches to bringing out the best in people according to their culture and what it accepts? There is a perfect coincidence between the intent of the two principal players and the results produced, despite the antagonism that keeps the audience in suspense as to how and whether this situation can be resolved. Sound of the music and cinematography are gorgeous. The acting is expressive (facial gestures tell everything) and the interplay of youth and age and talent fascinating. This has to be an Oscar nomination for best foreign film of 2015, and it could stand as one of the great movies of all time. Liza☆ Aug 21 2014 7:49 pm Waa Miwa is going to be there too! CAN'T WAIT TO WATCH THIS!! Sakura Sxouran Jun 18 2014 9:17 pm Woah 2015... So long.. Cant wait for this movie. Tori Fighting!!! Sakura Sxouran Jun 18 2014 9:16 pm Woahhhh 2015... So longggg.. Cant wait for this movie. Tori Fighting!! !